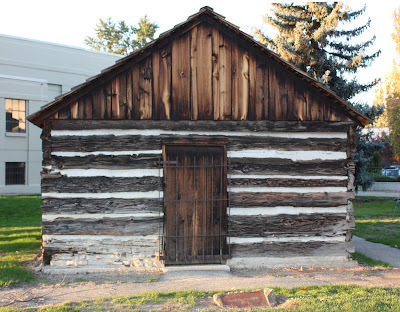 A Boise "house" built in 1863 - the year the city was founded. It was probably a mansion in its time. This is not the original location, several historic houses were moved to a site next to the Boise Historical Museum. This is the Coston Cabin - it belonged to Isaac Coston, a pioneer farmer. He lived in this cabin for 50 years. Every once in a while, you can tour the inside. It really is one room and there really is no bathroom. Those were outhouse days. wow, they had to have bars on the doors way back then. Ok I am guessing they were added later. One room, talk about no privacy. Nice photo. We have a very similiar building in Susanville. It is slightly bigger and was the only trading post for hundreds of miles. I love the lines in this photo. The same year of the Battle at Gettysburg! Amazing. There is a similar cabin in my hometown in Ohio that was moved to the county fairgrounds, along with an old drugstore (including barber chair), an old church building, and an old gas station. They are closed also except for the week of the county fair.